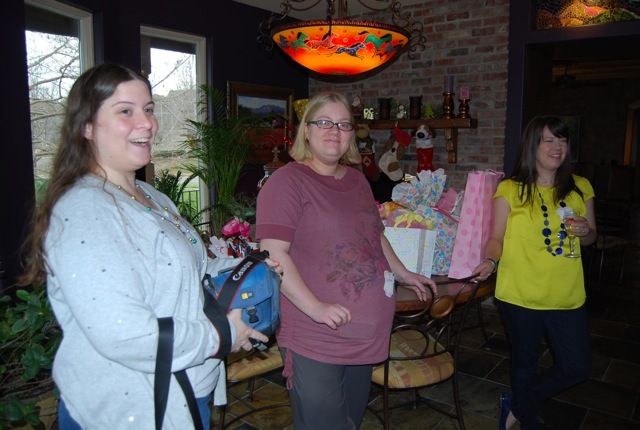 Two weeks later and I'm finally posting about my first baby shower in Kansas City. I was waiting on some pictures from friends but decided to go ahead & post what I had. I mainly just have photos of the decorations and not of the people there but if I get those later I'll post more. My best friend, Kara, and her mom, Vicky, were the two main hosts of the shower. We ended up having the shower a littler earlier on in my pregnancy because Kara is pregnant herself and due January 1st. See her shower here. She really wanted to throw me a shower but wasn't sure she would be up to it after the baby came so we decided that Dec. 15th would work the best. Vicky was so sweet to host the party at her gorgeous home, and she did most of the decorations & food too!! When I first saw everything I literally teared up because they completely out did themselves. I was honestly blown away. THANK YOU GUYS SO MUCH!! I loved everything about the decorations. 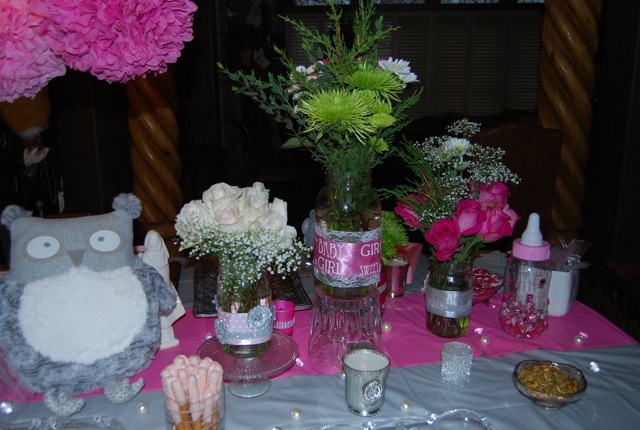 They went with a pink and grey themed shower (colors that I plan to use in our nursery). And I loved how they displayed my shower invitation in a frame too. Vicky made this banner all by hand and I just fell in love with it! Seriously check out this table setup! I'm pretty sure my jaw hit the flower when I saw it. Here are a few closer shots of the table. 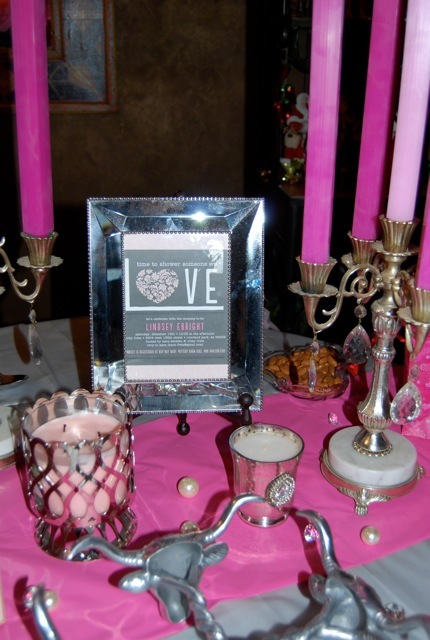 I really loved the squared pink candle sticks. Pictures from the back of the table. How cute is that Owl? It's from Pier 1. 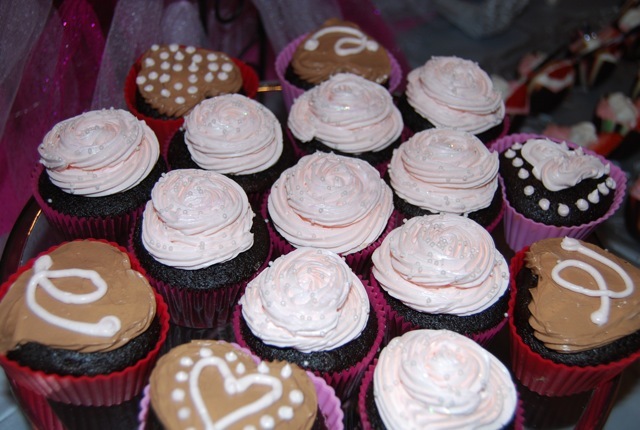 These gorgeous cupcakes were made by my very talented friend Kristen. Don't these look professional? I think she should open a side business. 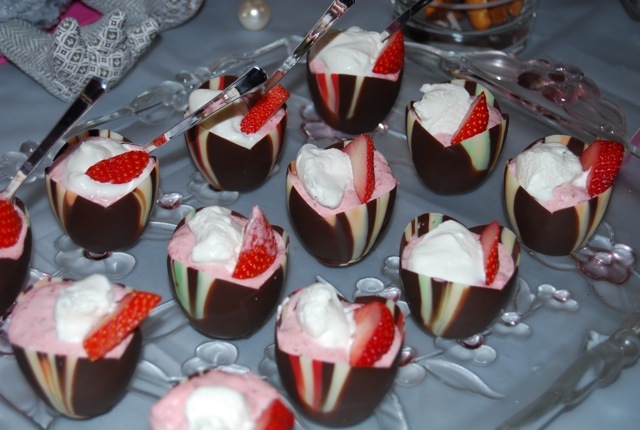 Vicky found these delicious mini chocolate bowls and made strawberry mousse from scratch to fill them with. 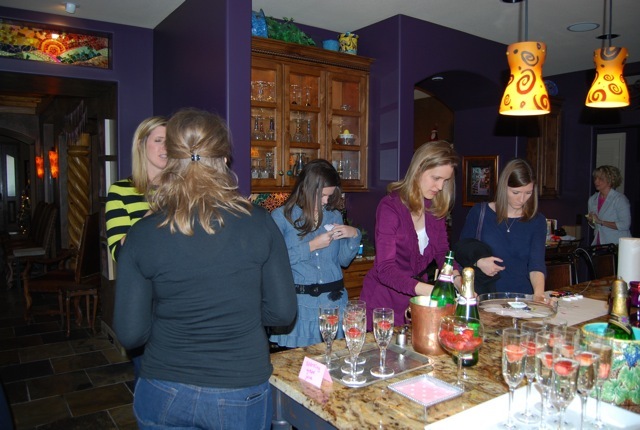 They even had sparkling grape juice for the preggos and champagne for the rest of the girls. My good friend, Megan, was in charge of the games. She had a separate advice card for Ryan & one for me for everyone to fill out. Ryan & I loved reading through them all and will be fun to continue to look through them over time. Then we all played the game where you have to guess what baby names belong to what celebrities. I tried to add what pictures I did have of people. My sweet friend, Emily, just had her baby on Thanksgiving day just a few weeks before. And I couldn't believe she made it out for my shower!! I was so excited to see her and meet Caden. 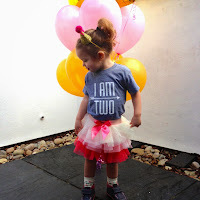 See her baby shower here. I feel so blessed to have such wonderful friends that truly showered Ryan & I with so much love and gifts for Maggie. I can't say thank you enough! 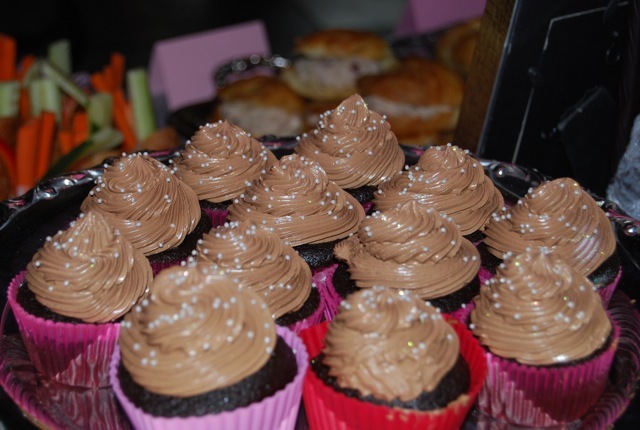 Oh my goodness, those desserts look delicious! What a gorgeous shower!! 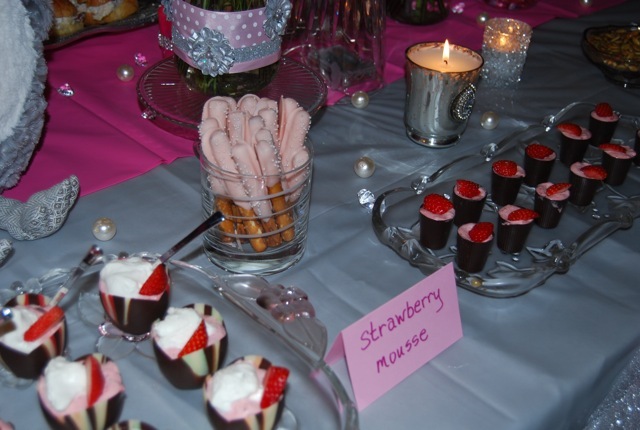 And that strawberry mousse looks to die for! Oh my word! What an amazing and gorgeous shower!!! They outdid themselves!!! So fun!! 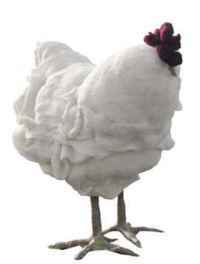 You look gorgeous too! Oh my gosh, those decorations and the table set-up were AMAZING! !